Will President Bush's troop surge work? Calling the situation in Iraq “unacceptable,” President George W. Bush announced on Jan. 10 he was sending 21,500 additional U.S. forces as part of a new strategy to turn the war around. 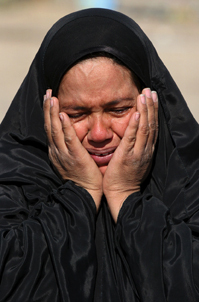 The so-called surge follows an especially grim year in Iraq: 823 U.S. troops and an estimated 28,000 Iraqi civilians were killed in 2006, reflecting stepped-up attacks by Sunni insurgents and Shiite death squads. In November, with the U.S. military death toll approaching 3,000, American voters signaled their disenchantment with the war by overturning Republican control of Congress. After taking the congressional reins, Democrats struggled to show their disapproval of the troop buildup without cutting off funds for the troops. And a blue-ribbon, bipartisan commission urged the president to negotiate with neighboring Iran and Syria to head off a regional conflict. Meanwhile, many experts doubt the Iraqi government can meet new benchmarks for progress set by the United States.